Three months ago, we shared the victorious news that the courts had upheld the 20-year ban on new uranium-mining claims on one million acres of public land around the Grand Canyon for the second time since 2014. But last Friday, two mining industry trade groups, the American Exploration and Mining Association (AEMA) and the National Mining Association (NMA), petitioned the U.S. Supreme Court to review the December court decision that upheld the ban. 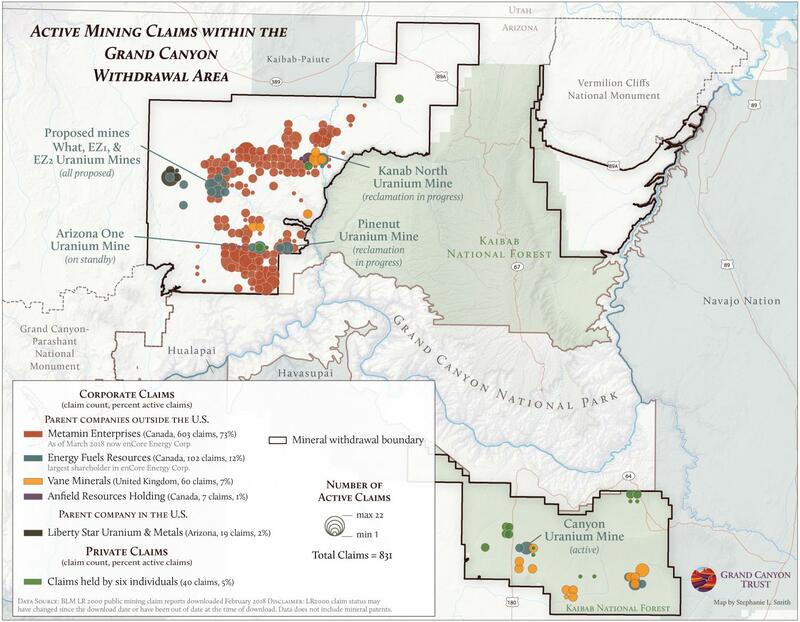 According to Bureau of Land Management data, there are at least 831 active mining claims around the Grand Canyon. Just four companies, which are subsidiaries of foreign companies based outside of the United States, hold 93 percent of the existing claims in the area of the ban. Metamin Enterprises holds 71 percent of the active claims around the Grand Canyon and is a party in the lawsuit that AEMA and NMA are trying to bring before the Supreme Court. And Vane Minerals, a subsidiary of a UK-based corporation that holds roughly 7 percent of the claims around the Grand Canyon, wrote a letter to Interior Secretary Zinke asking him to “terminate” the temporary ban on new uranium claims around the Grand Canyon. So in an attempt to create a need for their product, Energy Fuels, which holds 12 percent of existing claims in the area of the mining ban, and another uranium company, Ur-Energy, are petitioning the Trump administration for “buy American” requirements under the same section of the Trade Expansion Act of 1962 that yielded the recent Department of Commerce recommendations on quotas and tariffs for steel and aluminum. And just this month, the Department of the Interior included uranium on a draft list of critical minerals, which could pave the way for streamlining an already relatively permissive permitting and review process for uranium mines (especially if this bill ever makes it through Congress). Uranium shouldn’t be on that list because it’s a fuel mineral, and critical minerals aren’t supposed to include “fuel minerals” by definition. In November, the Forest Service recommended the Grand Canyon uranium ban for review as part of the agency’s response to a 2017 executive order signed by President Trump and aimed at promoting domestic energy independence and economic growth. More scrutiny should be given to whether that goal would be promoted by opening up the Grand Canyon to uranium mining, given that nearly all the mining claims around the canyon are currently held by foreign-controlled companies. In any case, we know that uranium mining is not a major economic driver in the region, and it’s hard to imagine the industry ever having the ability to serve that role. For instance, though Energy Fuels has permission to operate Canyon Mine despite the withdrawal, the company has yet to begin hauling ore and has laid off most of its workforce. The company estimates it will temporarily employ just 60 people if and when the mine reaches peak operation, and the uranium reserves at Canyon Mine are estimated to reach depletion after just 10 years of mine operation. Finally, if there’s no research, there can be no evidence, right? That’s the next move in the mining industry’s playbook. When former Interior Secretary Ken Salazar initiated the pause on new uranium claims around the Grand Canyon, it was to allow scientists time to study the risks and impacts that come with mining uranium near this natural wonder. But President Trump’s 2019 budget proposes to eliminate all funding for the U.S. Geological Survey’s studies on the topic, handicapping the ability of researchers to study the issue and better understand how uranium mining could affect groundwater. The Grand Canyon is too precious to mine. The Grand Canyon is a World Heritage Site, it’s sacred to numerous Native American tribes and draws millions of people to northern Arizona each year. Why on Earth should we allow mining companies to profit from putting it at risk? The Grand Canyon is simply too precious to mine. I hope the Supreme Court continues to hold strong against unnecessary and harmful mining of one our nation's greatest landmarks. There is a demand for clean energy and environmentally forward companies. Unfortunately, fuel companies refuse to pay attention to predictive analytic and will not grow with the times. The Grand Canyon is way too precious to Americans, I can't imagine any patriot that would want to harm it.